Surely it was like that for me considering the trip's indulging on board experience combined with stimulating off shore excursions to several riverside locations, rarely visited by world travellers. 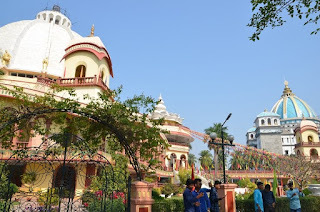 One of the world's most revered waterways since mythical time, River Ganges, locally called Ganga, originates up north in the Himalayas and empties into the Bay of Bengal after flowing for almost 2500 km through Indian plains. 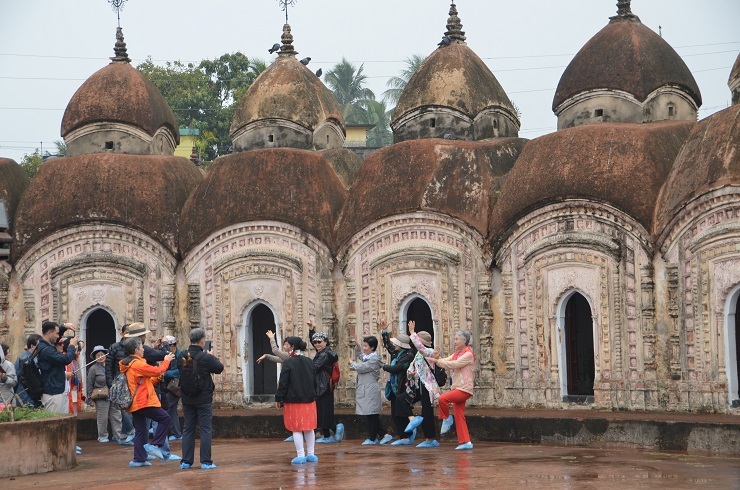 Since time immemorial it has been a silent witness of many episodes of the land's volatile history, religious turn arounds and cultural expressions. So a week-long raw encounter with this legendary river and its edging land is nothing less than a lifetime sensation. The comforts and luxury of the boat adds to this exotic feeling. 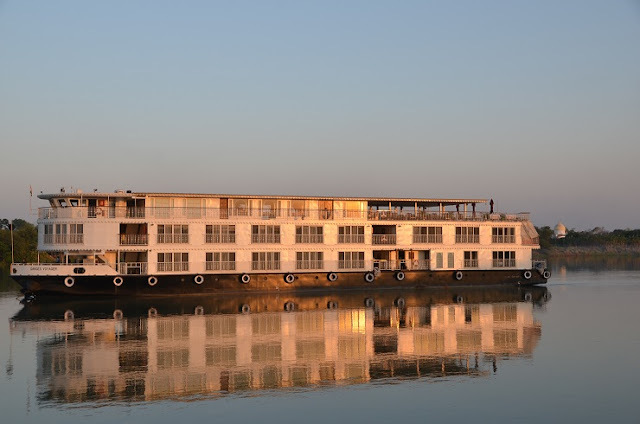 Delhi based Exotic Heritage Group built this 56m long vessel in 2015 as an epitome of luxury on water. There are 28 tastefully decorated, high-ceilinged and fully carpeted suites of five categories to choose from to accommodate 56 guests. Crafted with hand-painted murals, each of the suites include almost everything that comes to mind when thinking of top end plush and stylish accommodation. In addition to featuring a floor to ceiling French balcony to enjoy the outside passing parade, even the entry-level suite includes a large double or twin beds with soft linen and generous pillow selection, bedside drawers, dressing table, two lounge chairs with a centre table plus all modern amenities from in-room safe and minibar to iPod docks, alarm clock, international electrical plugs and a flat screen television. While the spacious wardrobe includes comfy bath robes and slippers, the private bathroom is nicely done up with a rain shower, hairdryer & premium quality toiletries. The vessel has three decks. 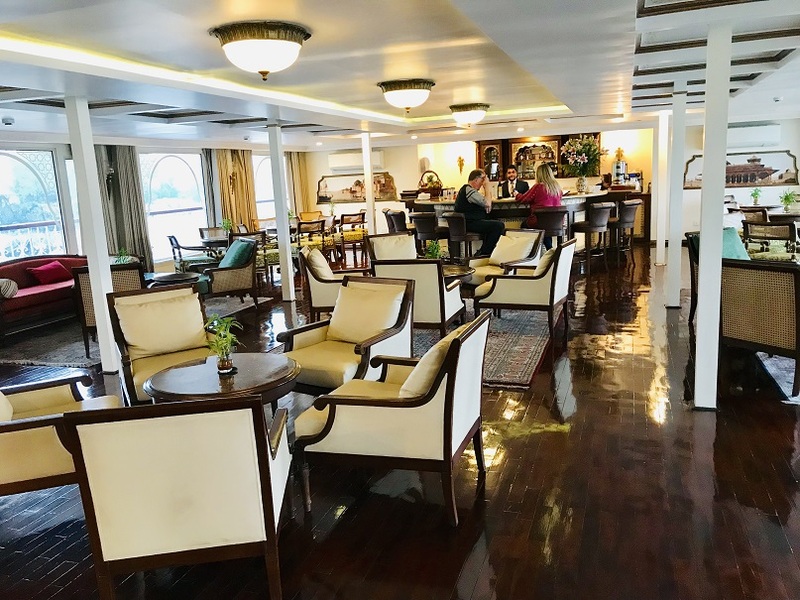 While the lower two accommodates the suites, the top one features the sun deck fitted with comfortable seating for lazing around and to enjoy the passing scenery, the gym and the spa to stay well and fit and the Governor's Lounge to socialise. 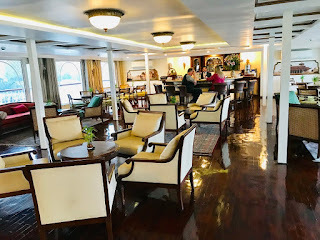 Fitted with comfortable seating, this lounge is a very popular hub for the guests not just because of the well-stocked bar but also being the usual venue for lectures, after dinner movies and making new friends. Food is always an important part of any travel and here it can be summed up as a gastronomical delight presented by an incredible mix of tasty and healthy Indian, other Asian and continental cuisine. Sumptuous meals at breakfast, lunch and dinner are served at the East India Dining Room located on the lower deck. 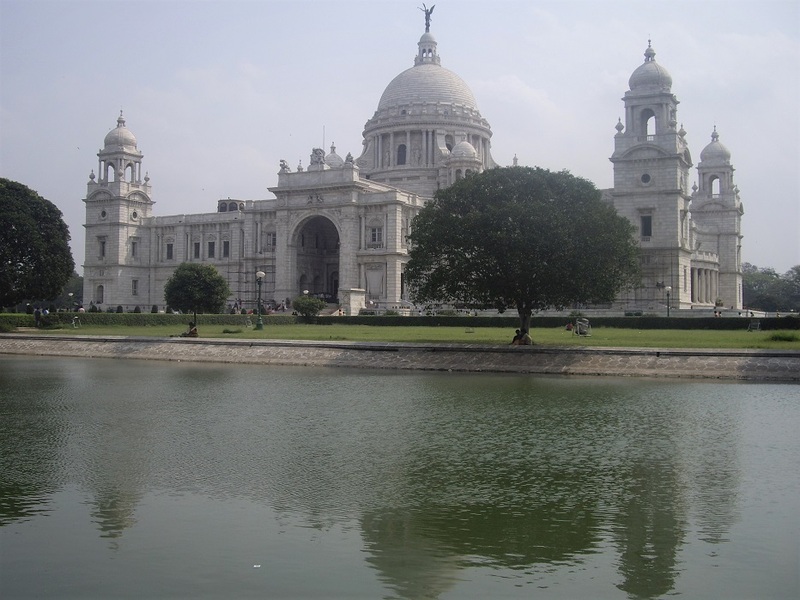 Our itinerary began and ended at the 350-year-old, teeming city of Kolkata, earlier called Calcutta. 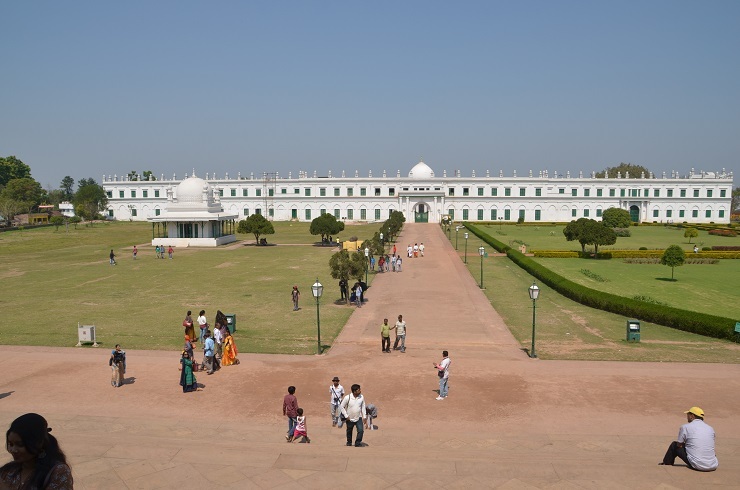 We stayed two nights on board there and glanced through many of its iconic sites which are mostly the products of the British Raj which ruled India until 1947. This includes the majestic Victoria Memorial, a white marbled edifice built in 1921 in memory of Queen Victoria who after annexing India to her British Realm in 1858 directed building of this city on the Ganges like London on the Thames. She lovingly referred to this city, which was the capital of British-India until 1911, as the second city of her kingdom. While in Kolkata we also visited Mother Teresa's home. Every day there were halts at riverside locations of historical, artistic or religious significance for shore sorties. 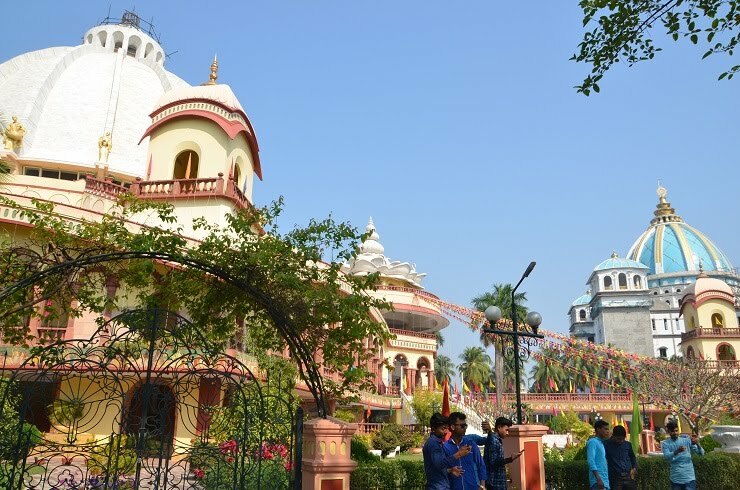 While the 19th century temple architecture of Hindu temples at Kalna and Baranagar or the Islamic art inside the Imambara shrine in Hooghly impressed us, we were soaked in the vastness of the Hare Krishna temple complex in Mayapur and got immersed in history of power, greed and treachery at Murshidabad, now a shabby little township but a bustling settlement 250 years ago when it was he capital of the Bengal Province. It was here the infamous "Battle of Plassey" was fought in 1757 where British commander Robert Clive overpowered Nawab Siraj Ud Dullah, the 27-year-old Muslim ruler by traitorous means bribing his senior minister Mir Zafar and flagged off the journey of a long colonial rule in the subcontinent for the next 200 years. Overall it was a rejuvenating journey for all of us. When disembarking I noticed a kind of bliss on everyone's face. Perhaps that was the parting gift from the holy river. Getting there –. Singapore Airlines (www.singaporeair.com) operates daily flights from Australia to Singapore from where, as per current schedule ,they fly to Kolkata, four days ( Mon, Wed, Fri & Sat) of the week; other days Singapore to Kolkata flights are operated by their regional carrier Silk Air (www.silkair.com). Visa – Australia passport holders will need a valid visa to enter India. For more info on how to obtain a visa please see www.vfsglobal.com.